When it comes to material, there can be wooden or metal beds depending on your choice and needs for room. Normally metal beds are inexpensive and easy to transport from one room to another. Its frames can be painted and select the right mattress to make it comfortable. The metal twin beds will be good choice for your small rooms. The Wolfhurst Panel Bed features a textured powder coated matte black finish bed frame which is sturdy and very appealing to the eyes. This bed looks fantastic, classy and expensive (price is easy on your wallet) and will add value to your bedroom décor. Substantial and sturdy metal construction. 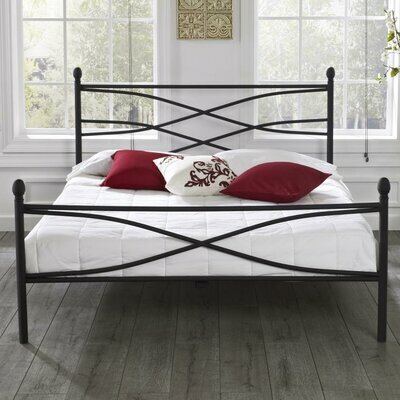 Add style and value with elegance to your bedroom with this stunning and elegantly stylish FBG Linden Metal Bed. The bed is sturdy metal construction with powder coated elegant ebony finish and features beautifully designed headboard and footboard with center support legs to ensure endurance and stability. Powder coated elegant ebony finish. Headboard. Footboard, side rails included. Center support legs (in king and queen size beds). Product Care: Wipe with a clean damp cloth for better results. Accentuate the elegant look of your bedroom with this classy Laroche Metal Bed that features a slightly distressed finish. 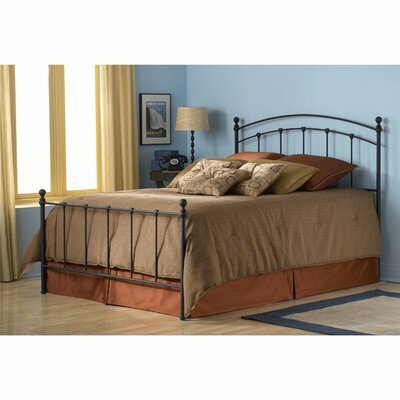 The bed is sturdy metal construction and is very easy to put together. Includes 3 slats, side rails, headboard and footboard. Bed can easily accommodate both box spring and mattress. Add charm and elegance to your bedroom with contemporary yet Victorian look of Lyster Platform Bed that features a higher profile headboard and a simple rail design. Solid metal construction with metal slats and center support system renders stability and durability to this show stopping piece. The dynamic design and round finial posts with white finish make this metal bed a must have in any bedroom! White finish with finial detailing. Center support legs for durability. Weight limit: 225 – 500 lbs. Hodedah Metal bed comes in a unique style with two toned black and silver chic design that complements well with a wide range of furnishings and bedroom décor. This bed will prove to be a brilliant addition to any bedroom with its contemporary style and sturdy metal bed frame construction. The bed includes headboard, footboard, side rails and metal slats with center supporting legs that help to protect your mattress from warping and keep it comfortable for many years to come. Hodedah Metal Bed in Black & Silver collection. Black and silver metal frame. Includes headboard, footboard and side rails. 7 legs support system for stability and endurance. Contemporary style of this InRoom Designs Manhattan Metal Bed will enhance the pleasant feel of your cozy bedroom with its sturdy and sold metal construction with beautiful bronze finish and undertones of purple. The Manhattan Metal Bed features tubular metal bed frame with 7 layered metal slats, 1 center support and 2 adjustable legs. The weight limit of bed is 400 lbs and is also available in full, queen and twin size. InRoom Designs Manhattan Metal Bed collection. Tubular metal bed with layered slats. 7 metal slats with 1 center support and 2 adjustable legs. Weight limit is 400 lbs. The classy and traditional Sayles Panel Bed features a decorative metal grill headboard, footboard and side rails. The Sayles Panel Bed is constructed from fully welded heavy gauge square tubing and solid wire and ensures stability and endurance to last for years. Sturdy metal and sold wire construction. Fully welded heavy gauge tubing. Elegant yet stylish finial design. Luxury Home Rosalyn Metal Bed adds elegance with style to your bedroom. The bed is constructed from the sturdy metal and features European style slat system with double slats in 3 lumbar rows to provide extra support to mattress with box spring-like. The simple and elegant design of the headboard and footboard makes this bed a unique and stylish addition to your bedroom. Double slats in 3 lumbar rows to provide extra support to mattress. Simple yet stylish and elegant, this Modway Townhouse Twin Metal Bed emerges with historic appeal from the fully welded stainless steel construction and tubing. Classic arc-shaped design of headboard and footboard of this beautiful bed will gladden your bedroom décor with its stunning and decorative metal banding that adds lighthearted rejoicing to the solidly lineal rail design. 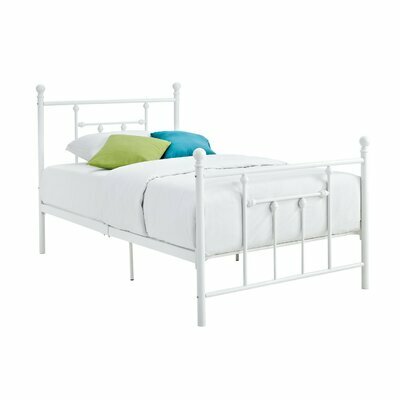 Modway Townhouse Twin Metal Bed. Ideal for both country and urban décor. Fully welded solid iron construction. Box spring and slats not required. The striking woven design that flows through both the headboard and the footboard of Vista Metal Bed will add a touch of sophistication and elegance to your warm and cozy bedroom atmosphere. This bed features a silver metallic finish as well as espresso-hued wood posts that adds value to the metal bed frame. 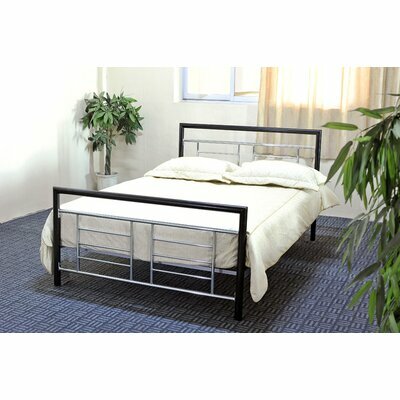 Vista Metal Bed will prove to be a valuable addition to your bedroom décor. 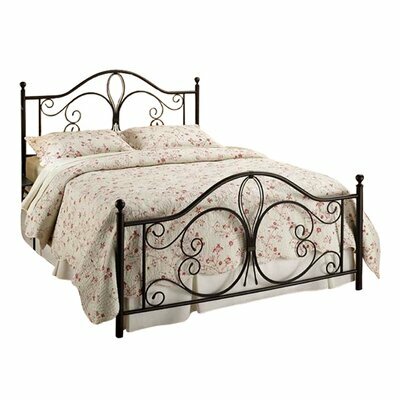 Hillsdale Furniture Vista Metal Bed collection.